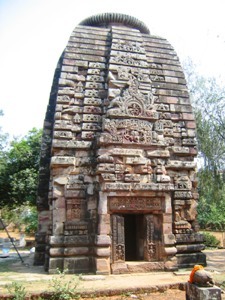 One of the oldest temples of Odisha, the Satrughaneswar temple belonging to the 6th century A.D., represents the old Kalingan style of architecture. The origins of the monument apparently lay further back. It represents a Sikhara temple and its shape as available now after restoration and a few sculptures that still exist on the temple, deliver similarity with those of the Dasavatara temple at Deogarh. The sculptures of the Satruganeswar are marked by the dynamism & energy of the designs recalling the best characteristics of the Post-Gupta Art. The ruined temple of Laxmaneswar standing by its side appears to be a closely similar monument in shape as well as form and seems to be an immediate successor of the Satrughaneswar.